What’s The Difference Between Update And Upgrade? Usually, update and upgrade both are different ways to make a change to the software, app or operating system. However, in between them, there are many modifications made. So, here in this article, we will be discussing update and upgrade and what are the prime differences. Well, in this digital world, many things confuse us. One of the most confusing things is to differentiate between upgrade and update. There are times when we need to update things on our computer, and then there are times when we need to upgrade. However, both of these are different, but both of them involve making changes to the software running on your computer or smartphone. Updates are something which we get more compared to upgrade. The update involves making changes to a software or an operating system. However, the update doesn’t alter the core structure of the operating system. Most of the frequent changes that are made to your computer or smartphone like security patches, adding new drivers, bug fixes, additional features, etc. are termed as an Update. It’s worth to note that updates are mostly small in size and it can be installed in just a few minutes.The size of an update can also differ, but it will be in MBs. For instance, computer updates can go beyond a hundred megabytes. Updates need less time to be installed on your device, whereas the upgrade can take hours. 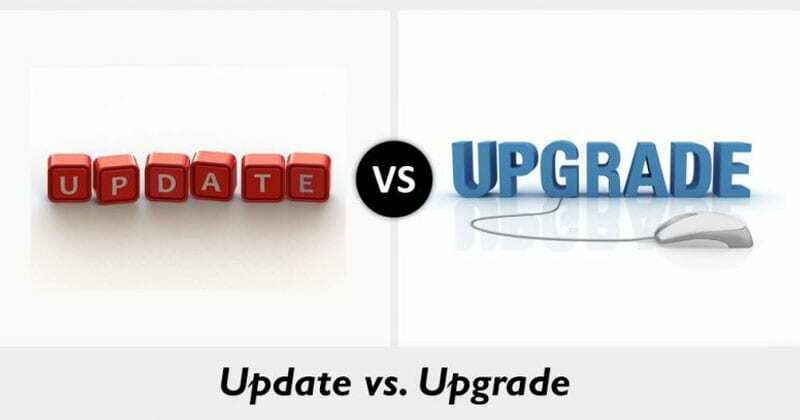 Upgrade involves making changes to a software or an operating system. To upgrade the modifications made to the software or an operating system are significant, and we can expect a few hours of off-time during the upgrade procedure. For example, if you switch from Windows 7 to Windows 10, it’ll be called Upgrade, not update. Similarly, if you are switching from Ubuntu 16.04 to Ubuntu 17.04, its also called an upgrade. The upgrade includes a variety of new features and options which are not found in the existing version of the operating system. The same thing happens with apps too, for example, if you are switching from Adobe Photoshop CS4 to Photoshop CS5, it would be called an upgrade. The size of the upgrades are usually larger compared to the update, and it takes more time to be installed on your device. In fact, if you are upgrading your Windows 7 to Windows 10, you can expect few hours of off-time. Updates are often free because their price is usually included in the amount you pay when you buy the software. However, during Upgrade, software vendors might charge you. Upgrades are bigger and complex compared to update. Upgrades usually take hours to install on your device whereas updates can be installed in minutes. Updates often include bug fixes, security patches, new features, etc. Whereas, upgrade brings significant and substantial changes to the software. Upgrade also makes some significant changes to the version number. For example, Android 6.0 to Android 7.0, or Windows 7 to Windows 10.